Fuqing dialect (福清話, BUC: Hók-chiăng-uâ, IPA: [huʔ˥ tsʰiaŋ˥ ŋuɑ˦˨]), or Hokchia, is an Eastern Min dialect. It is spoken in the county-level city of Fuqing, situated within the prefecture-level city of Fuzhou. It is not completely mutually intelligible with Fuzhou dialect. The Fuqing dialect has fifteen initials, forty-six rimes, and seven tones. Including the null initial, the Fuqing dialect has fifteen initials, excluding the phonemes [β] and [ʒ], which are only used in connected spoken speech. (The Chinese characters represent the sample characters taken from the Qī Lín Bāyīn (《戚林八音》, Foochow Romanized: Chék Lìng Báik-ĭng), while the Latin letters are from the orthography Foochow Romanized). [θ] is a voiceless dental fricative, which some pronounce as [s]. [ts], [tsʰ] and [s] palatalize to [tɕ], [tɕʰ], [ɕ] before finals that begin with /y/, the close front rounded vowel (i.e. before the finals [y], [yo/yɔ], [yoŋ/yɔŋ], [yoʔ/yɔʔ]). Including the syllabic nasal consonant [ŋ̍], the Fuqing dialect has forty-six rimes in total. Apart from [ŋ̍] and [iau], all rimes have a close/open distinction. The rime before the slash is the close or tense rime (緊韻、窄韻), while after the slash is the open or lax rime (鬆韻、寬韻). The Chinese characters represent the sample characters taken from the Qī Lín Bāyīn (《戚林八音》, Foochow Romanized: Chék Lìng Báik-ĭng. Within the Qī Lín Bāyīn, the ru rimes are assigned under the corresponding yang rimes; hence, the sample characters for yang and ru rimes are the same. The Latin letters are from the orthography Foochow Romanized). The rime [iau] only has one syllable [ŋiau], and is not found in the Qī Lín Bāyīn; furthermore, Foochow Romanized does not have a way to represent this syllable. In the modern Rongcheng dialect, the rime [iu/ieu] has now merged into [ieu/iɐu] and is no longer distinguished. Also in the new Rongcheng dialect, the rime [ui/uoi] has merged into [uoi/uɐi]. The syllabic nasal [ŋ̍] in the modern Rongcheng dialect is read as [iŋ]; some sources have not yet listed this final in their charts. The dark level (陰平 Ĭng-bìng) tone falls the most sharply; although the light departing (陽去 Iòng-ké̤ṳ) tone is also a high falling tone, its fall in pitch is not as dramatic. Additionally, the Fuqing dialect contains the neutral tone in colloquial speech, which in tone sandhi produces a new tone contour, one that rises (˧˥, 35). The phenomenon of close and open rime alternation (also known as tense and lax rimes; in Chinese "寬窄韻現象", "鬆、緊韻現象" or "本韻、變韻現象") is one found throughout the dialects of cities and villages in the traditional Fuzhou area (the ten towns of Fuzhou, 福州十邑). But it is not found in, for example, the dialects of Gutian (古田) and Luoyuan (羅源). The dialect of Fuqing, along with that of the urban area of Fuzhou, exhibits this phenomenon. According to the original listing of the rimes in the Qī Lín Bāyīn, the medial vowel did not change with the tones. But in the Fuqing dialect, when the rime is in either one of the departing tones or in the dark entering tone, the medial vowel changes to another, the rime being called the open rime. When in either of the two level tones, in the rising tone, or in the light entering tone, the rime this time does not change; this rime is called the close rime. In the Fuqing dialect, with the exception of [ŋ] and [iau], all rimes exhibit this close-open alternation. As an example, the rime from "春" in the Qī Lín Bāyīn, lists the two rimes: [uŋ] and [uk]. In the Gutian dialect, the same vowel is preserved in the rime [u], regardless of tone. But in the Fuqing dialect, the rime [uŋ] in the dark departing (陰去) and light departing (陽去) tones changes to [oŋ], where the vowel in the final [u] has become [o]. Similarly, [uʔ] in the upper departing (上入) tone becomes the open rime [oʔ], where the vowel has again changed. Within the Fuqing dialect, the open rime's vowel is always more open (alias 'lower') by a degree than the close rime. For example, 知 is read [ti] as a close rime, with the close vowel [i]. Listed as the same rime but in a different tone (i.e. light departing 陽去) is 地, which is instead read as [te], an open rime with the half-close vowel [e]. This is more open than [i] by one degree. All close rimes becomes their corresponding open rimes according to this rule. The Fuqing dialect has a particularly rich set of phonetic changes. The pronunciation of a particular Chinese character under certain circumstances can undergo changes in its initial, its rime, and its tone. For example, the word 兄弟哥 (brother, Standard Mandarin: 兄弟) is made of the three words 兄 /hiaŋ˥˧/, 弟 /tiɛ˦˨/ and 哥 /ko˥˧/, but is actually pronounced as 兄弟哥 /hiaŋ˥ nie˥ o˥˧/. Within this word, the first syllable 兄 has undergone tone sandhi and has thus changed tone; the last syllable 哥 has lost its initial consonant; and the rime of the middle syllable 弟 has changed in both vowel and tone. Within lexical or semantic items, the three features of initial, rime and tone are subject to sandhi phenomena. In colloquial Fuqing speech, this type of change is very frequently encountered, but is rare in Chinese as a whole. In colloquial Fuqing speech, the initial consonants of Chinese characters or syllables are subject to change under specific circumstances within lexical items. The first modern work to examine the phonology of the Fuzhou dialect, the Mǐnyīn Yánjiū (閩音研究) used the term "initial assimilation" (in simplified Chinese: 声母类化; traditional Chinese: 聲母類化; pinyin: shēngmǔ lèihuà) to refer to this phenomenon. The Fuqing dialect contains two voiced initial consonants, /β/ and /ʒ/, that only appear through initial assimilation. Initial assimilation in the Fuqing dialect occurs in polysyllabic lexemes (i.e. lexical items or words of two or more syllables or Chinese characters) and certain semantic groups. Usually within these groups, all syllables apart from the first undergo initial assimilation. But if the initial of the following syllable is a nasal or /l/, then the initial assimilation does not occur at that point. Not every phrase will undergo initial assimilation, and the ones that do may differ from their counterparts in the other Min Dong varieties. The syllable that undergoes initial assimilation is the "latter character"; that which precedes it is the "former character". Initial assimilation in the Fuqing dialect consists of three types: voicing, nasalisation/nasal assimilation and suppression. The rime of the former character determines the type of assimilation of the latter character's initial. Which voiced consonant or nasal consonant or whether the consonant is suppressed depends on the place of articulation of the latter syllable's initial. Type A dentals after voicing assimilation do not become the standard [l], but are slightly flapped. 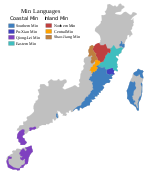 As with the majority of southern varieties of Chinese, the Fuqing dialect exhibits tone sandhi. The phenomenon of tone sandhi in the Fuqing dialect contains a whole set of rules to be followed, but it is still rather complex: one tone can undergo different changes depending on what tone follows it. For example, the light entering (陽入) tone in front of the dark departing (陰去) tone becomes ˩ (11), but in front of a rising tone (上聲) it becomes ˥ (55); and in front of the dark entering (陰入) tone it becomes ˨˩ (21). In many local dialects of the Fuzhou area (within the Eastern Min family), the last syllable of a word does not undergo tone sandhi. However, in the Fuqing dialect, the last syllable's tone does change under certain circumstances. Aside from words composed of two syllables (or binomes), those composed of three syllables also undergo tone sandhi. Within polysyllabic words (of two or more syllables) or characters within one sense unit, if in the departing tone (both light departing and dark departing) or in the dark entering tone, and if it is not the last character in the unit, the rime undergoes a transformation. This rime change is related to the open/close rime phenomenon: as these three tones only have open rimes, when the character changes tone through tone sandhi, the open rimes will become the corresponding close rimes. Hence /tsʰiaŋ˥˧/「清」being light level tone has a close rime, so although it is in a non-final position within the group, its rime does not change. On the other hand, /hoʔ˩˨/「福」 is light entering tone, while /keiŋ˦˨/「縣」 is dark departing tone; both characters hence have open rimes. As 「福」 is in a non-final position in its group, its rime changes;「縣」 is the last character and so resists the change. the tone sandhi system of the new Rongcheng dialect has converged with that of surrounding areas. a clear distinction of the [iu] 秋 and [ieu] 燒 finals. some words with voiced initials in entering tones retain the final glottal stop whereas the others have lost that glottal stop. For example Chinese: 藥 medicine is read as [yoʔ˥] in Jinyin as opposed to [yo˥˧] as in Rongcheng. There is a high degree of mutual intelligibility between the three branches despite their differences, and the original Rongcheng dialect (now part of Yuping Road (玉屏街道) is well understood across the whole Fuqing region. The Fuqing dialect has lost the voiced obstruents from Middle Chinese, has merged the final nasal consonants into one phoneme and similarly for the entering tone final stop consonant. But it has also preserved many readings from Middle Chinese: its pattern of entering tone readings greatly matches that of Middle Chinese, apart from the colloquial layer of character readings which has lost them. Old and Middle Chinese had a large array of voiced consonants, which are preserved in the Wu group of Chinese varieties, e.g. in the Suzhou dialect. But the Fuqing dialect has devoiced the obstruents, turning them into voiceless consonants, just as other Eastern Min varieties of Chinese have. The Fuqing dialect does have two voiced obstruent phonemes, but these appear in connected speech, and are not part of the initials in the phonological system. The 疑 initial of Middle Chinese, reconstructed as the velar nasal /ŋ/, has not been preserved by many modern varieties of Chinese. In standard Mandarin, the initial [ŋ] has been completely lost, with some having merged into the initial [n] (e.g. 牛, 虐, 擬 etc.). In Wu, Yue and Hakka, the [ŋ] initial with front vowels /i/ and /y/ are either lost (hence merging into the 影 initial) or become another initial. But in the Fuqing dialect, the 疑 initial is preserved as [ŋ] in front of front and back vowels alike, with a few exceptions having merged into /m/. In some Mandarin varieties as well as Yue, a [ŋ] sound is added to the beginning of back vowels of the null initial class 影 (e.g. pronouncing 安 as [ŋan]), but in the Fuqing dialect the 影 initial always remains null. The Middle Chinese 非 group is pronounced in the Fuqing dialect not with [f] but with [p], [pʰ] or [h]. For example, 發 read as [puɔʔ], 蜂 read as [pʰuŋ], 非 read as [hi]. A group in Middle Chinese corresponding to 知 is pronounced with alveolar consonants [t] or [tʰ], and not with retroflex affricates, for example, 知 as [ti], 竹 as [tøʔ], 重 as [tʰyŋ]. The three nasal codas of Middle Chinese have become one velar nasal [ŋ] in the Fuqing dialect. The three departing tone voiceless stop codas also all became a velar stop [k], which has weakened to a glottal stop [ʔ]. The Fuqing dialect possesses just one tone derived from the historical rising tone (上聲) of Middle Chinese, the dark rising tone. The light rising tone merged with the light departing tone, with a split in those that started rising tone characters with voiced sonorants: in literary readings they grouped with light rising tone, whereas in colloquial readings these adopted the pattern of dark rising and became dark departing. For example, 老 [lo˧˨ / lɑu˦˨], 雨 [y˧˨ / huɔ˦˨], 有 [iu˧˨ / ou˦˨] etc. Where in the rime book Qī Lín Bāyīn (《戚林八音》), an entering tone character begins with an unvoiced consonant (e.g. the initials 花, 嘉, 歌, 之, 過, 橋, 奇), these lose their stop consonant ending in colloquial reading and thus merge with either light departing or dark level tones. In the Fuzhou dialect these preserve their identity as entering tone in the colloquial reading. Nevertheless, in literary reading these characters retain their identity as entering tone in Fuqing as well as in Fuzhou. Usually when there is a difference between literary and colloquial readings, the literary reading is used in reading and more literary compound words, whilst the colloquial one is used in vernacular speech, common surnames and local place names. For example, the common verb 聽 listen has the colloquial reading [tʰiaŋ˥˧], the surname 劉 (Liu in Mandarin) is pronounced [lau˦], and the place-name component 清 in the names of Minqing 閩清 and Fuqing 福清 are pronounced [tsʰiaŋ˥˧], though the name of Qingliu County 清流縣, being outside the Fuzhou area, uses the literary pronunciation. Literary pronunciations are also used in poetry, with some readings specifically used only in this context; additionally, neologisms generally use literary pronunciation. Fuqing has had a long history of migration, with which has come a large number of different sources of vocabulary, creating several layers or lexical strata. One of the layers that the Fuqing dialect has is the Minyue language, which today remains as a source of colloquial vocabulary. Despite their common use, these vocabulary items often cannot be traced back to a Chinese root character. Vocabulary derived from Old Chinese can be classified into two types. The first comes from migrants from the Three Kingdoms period, when people of the Eastern Wu migrated to Fujian, bringing the varieties of Wu and Chu. This layer is already extinct in the Chinese varieties spoken in the homelands of the Wu and Chu regions, but it is still found across the Min varieties of Fujian. The second type derives from the Northern and Southern Dynasties. Such vocabulary is often used in colloquial speech. The lexical stratum from Middle Chinese derives from the Chinese spoken in the Tang dynasty, with some later additions from the Song dynasty, forming the principal literary layer. Modern Standard Mandarin Chinese has also been source of vocabulary, via neologisms or formal compounds. Some such words are replaced by coinages from local roots, e.g. bicycle, which in the Fuqing dialect is 骹踏車 instead of being directly cognate to the standard Mandarin 腳踏車. With contact with foreign countries, there have also been loanwords from non-Chinese languages, such as 加蘇林 for gasoline/petroleum, which in standard Mandarin would be 石油; also 馬臘加 (Malacca, which is 馬六甲 in Mandarin). In more modern times, the rise of new technologies, products and concepts has produced more direct loans from standard Mandarin, which may be used despite those sounds being rare in Fuqing dialect or even if there are Fuqing roots that could have been used. For example, a "night school" is 夜校, derived from standard Mandarin, and not 暝晡校 as would have been expected from native Fuqing dialect roots. ^ a b 馮愛珍：《福清方言研究》 Fuqing Fangyan Yanjiu, 1993, 社會科學文獻出版社, p.28. Because [θ] is a distinctive feature of the Fuqing dialect, and is the mainstream pronunciation, [s] is not listed on the chart. ^ Finals that end in "h" in Foochow Romanized have lost the final glottal stop represented by the "h", and have merged with the light entering tone. ^ a b 福清市志編纂委員會：《福清市志》, 1994, 廈門大學出版社 (Xiamen University Press), 《卷三十．方言》 (Vol. 30: Topolects). ^ Standard nomenclature refers to names of the tones as used in modern Chinese academia, which is also used by Standard Mandarin. This article follows this convention. ^ 王建華 etc.：連江縣國民小學鄉土語言教材－福州語 第一冊(教師手冊)，連江縣政府，民國九十年：p.8. This article uses the terminology from this textbook. ^ 陳澤平：閩語新探索, Shanghai, Far East Publishing House, 2003: p.25. ^ 袁家驊：漢語方言概要, Beijing, Language and Literature Publishing House, 2003: p. 289. ^ \Ye Xiangling 葉祥苓, Ye Xiangling 葉祥苓 (1993). Suzhou fang yan ci dian 蘇州方言詞典 (1st ed.). Nanjing: Jiangsu jiao yu chu ban she 江蘇教育出版社. ISBN 9787534319969. ^ 李如龍、王昇魁：戚林八音校注，福州，福建人民出版社，2001. Preface, page 12. ^ 沙平. 福建省寧德方言同音字彙. 方言. April 1999：282-295. This page was last edited on 15 January 2019, at 23:44 (UTC).